Collar uses a standard 9-volt battery (included). Up to 9 months use from a single battery. Note: This item is for the US and Canadian markets only. International customers should browse to PetSafe International to locate a dealer. The SportDOG In-Ground Fence System covers up to 100 acres, and is safe and effective for all dogs over 10 pounds. Installation is as simple as installing the wire (click for common installation questions) around the perimeter of your yard and plugging in the transmitter with the included adapter. Your dog wears a water-proof collar that receives a signal from the wire if he ventures too close to the perimeter. You may select from 4 different correction levels for each dog (low to high), plus a 'beep only' and 'vibrate only' mode for training or mild tempered dogs. Follow the included training instructions to get your dog used to his new boundaries and your dog will be staying safe at home in no time. 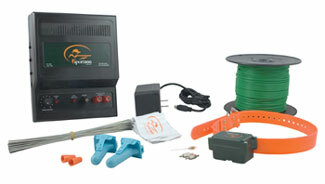 The SDF-100A Standard kit contains up to 100 acres, and includes 1000 feet of wire (will enclose approx. 1 acre), 100 boundary flags, and wire splices. The SDF-R Receiver collar is powered by a standard 9-volt battery. It is protected by our 30-day money-back warranty. If you're not completely satisfied, just return the product for a refund. Also includes a 1 year parts and labor warranty and a Lifetime parts warranty from SportDog..